Powell frequently emphasized that the Fed is neutral, patient and has no bias but the market has sniffed out a cut. 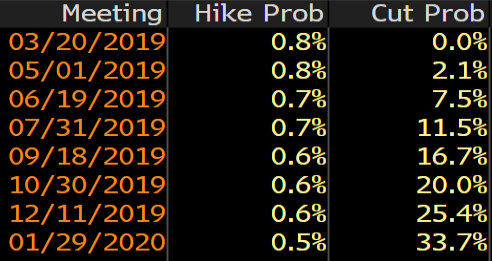 The Fed funds futures curve is pricing in a 47.1% chance of a cut in January 2020. That's a pretty big move. I though Powell would be more optimistic on the domestic economy. It wasn't that big of a surprise that he was dovish and worried about China and Europe but the caution domestically was more dovish than anticipated.